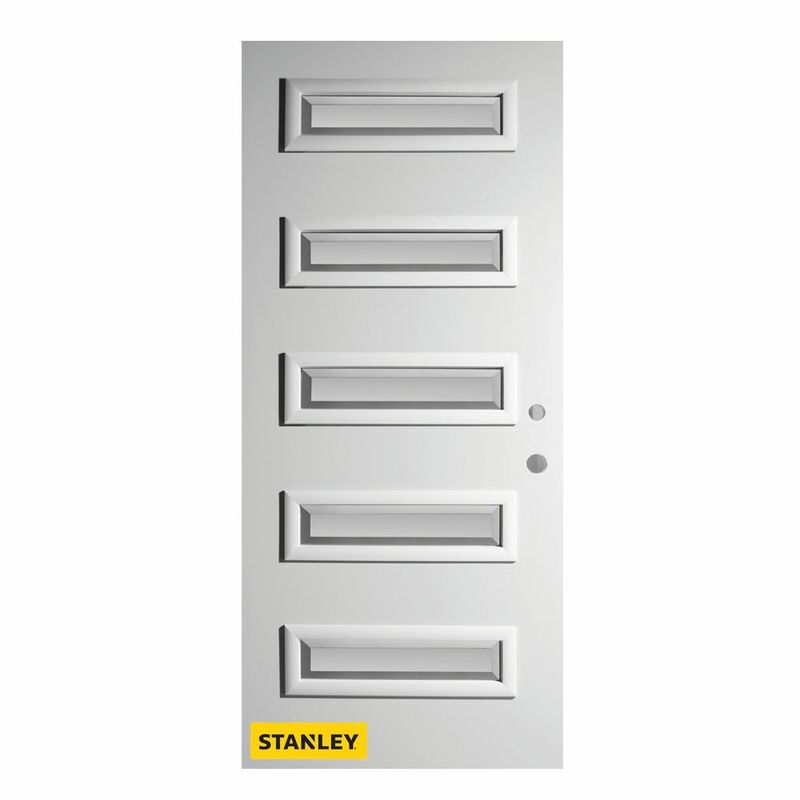 Stanley's Retro Collection of steel doors is definitely style-driven. These doors' retro style is both classic and current, while their performance is at a level that only a Stanley Door could provide. Their enhanced door lite frame adds an Art Deco appeal and further lends to their retro feel. For an entrance door that is both elegant and understated, choose this Satin Opaque glass. It offers a high level of privacy, while still allowing just the right amount of light in. This model is simple and classic and is sure to please any homeowner. Actual colours and appearance may vary slightly from image due to lighting. This classic 15 lite internal grille adds definition and style to this sturdy steel pre-hung entry door. ENERGY STAR certified and double bored, this 34 in x 80 in door can accept a lock set and deadbolt of your choice. PLEASE ALLOW 2-3 WEEKS FOR DELIVERY AS THE DOOR IS CUSTOM MADE. This beautiful arched pattern combines a delicate floral and leaf motif with translucent and opaque glass to complete this special wrought iron offering. This durable steel pre-hung entry door will enhance the value and beauty of your home. Double bored, the door can accept a lock set and deadbolt of your choice. 35.375 inch x 82.375 inch Ruth 5-Lite Satin Bevel Prefinished White Left-Hand Inswing Steel Prehung Front Door - ENERGY STAR® Stanley's Retro Collection of steel doors is definitely style-driven. These doors' retro style is both classic and current, while their performance is at a level that only a Stanley Door could provide. Their enhanced door lite frame adds an Art Deco appeal and further lends to their retro feel. For an entrance door that is both elegant and understated, choose this Satin Opaque glass. It offers a high level of privacy, while still allowing just the right amount of light in. This model is simple and classic and is sure to please any homeowner. Actual colours and appearance may vary slightly from image due to lighting.